“Your system has run out of application memory.” How is that possible? In my experience, this occurs when my main system hard drive is running low on free space. Operating Systems use the hard drive for extra memory storage, called "virtual memory". (I've definitely always wished that the OS could just reserve enough space for itself, but it just can't predict how many applications we'll be running). On top of that, it's worth noting that regular web use now requires far more memory than it did in the past. In activity monitor, you'll notice that every single tab & window (every open web page) is it's own process, taking up a significant chunk of memory. On top of that, account for all the ads, movies, flash, scripts, plugins and 360 videos etc. that we expect to run smoothly. New OS's and new web pages just use a lot of memory to provide us with the services we expect to "just work" (eg. syncing across devices, notifications, automatic updating etc. etc.). In short, in my experience there usually isn't a single process that's suddenly taking up a huge amount of memory (although a leaky program could indeed be a culprit - Sketchup 2016 does this to me, for example). More commonly, it's the additional functionality we expect of many programs/web plugins. I believe restarting the computer always alleviates this problem for a short while - primarily by unloading all the webpages and apps we had launched over time. But if our expectation of the computer and hardware constraints stay the same (and we run the same number of processes without changing anything else), eventually we'll run into the problem again. 1) Open fewer tabs/pages and fewer programs at one time. Close some web-pages/programs before opening the hefty apps, such as MS Office, Parallels, 3D CAD, Adobe programs etc. 2) Free up more space on the system hard drive (eg. move all your music and photos to another drive), to allow the system to handle your typical virtual memory needs. For me, this means my 1TB OS drive needs >20% free space (200GB)! Your requirements may be different. If you're on an older Apple laptop or iMac or Mini, the OWC Data-Doubler is a really fantastic way to accomplish this. Method (1) is my temporary fix, so that when I eventually enact method (2) I will have restored the snappy performance I expect while running many heavy-duty programs simultaneously. Could be a Google Chrome application memory leak as I had the same issue with it. Run Task Manager (in More Tools menu or got to chrome://system/) and check memory used by opened tabs and kill them. If won't help, Force Quitting the affected application should solve the problem. Alternatively check your memory pressure (memory_pressure command) and double check your free space so there is enough storage for swap files. Also try running sudo purge from the Terminal. It's possible there is some odd request for memory that the virtual memory system cannot oblige. The best bet is to restart the Mac and then run Activity Monitor to show the memory pressure and then observe those memory details when/if you reach that memory state again. It's likely something caused by a buggy program leaking memory - so you could look into updating any programs that are running when this last happened to ensure it's not something that a bug fix can remedy. The very same issue happened to me a couple days ago. I follow these instructions to reset my Mac's NVRAM and PRAM. The memory consumption went from 4.5 GB down to 2.8 GB when it started up. Turn it back on again and press & hold Command+Option+P+R (all at the same time) before the gray screen appears. Hold the keys until you hear your Mac start up for the second time (let it beeps twice). I had to repeat the process, one time right after the other, and now my memory issues have been solved. If you're seeing this message but the listed applications don't seem to explain the supposed excessive memory consumption, check whether non-application processes might be behind it. 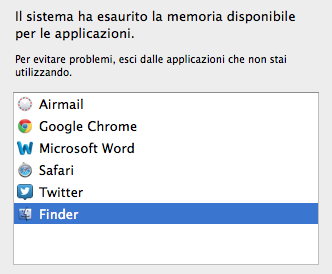 They'll be listed in the Memory tab of Activity Monitor, but won't appear in that dialog. I was being barraged by this dialog with neither the listed applications nor free disk space explaining the supposed problem. Turns out I had a few UNIX processes using unusually large amounts of memory. The amounts they were using still don't explain the dialog's claim, and memory pressure was still in the green, but as soon as I quit them (didn't even have to force-quit) the dialogs stopped and haven't recurred since. WARNING: It's a good idea to do a little online research into what any unknown processes are and do before forcibly quitting them, as some may have significant bad effects on the system if killed. Depending on the process, it may be preferable to restart the system either in lieu of, or immediately after, force-quitting it. More likely it is a problem with the OS itself. I just received this message when I had just a few programs open and memory pressure was "green" in Activity Monitor - but my uptime is 106 days. As everyone know - no computer/OS can run forever without a restart although 106 days is not a high number if you compare with mainframes, but for a personal system it is pretty good (albeit my second Mac's uptime is 168 days as we speak - with no signs of running out of memory). Restart is probably the best suggestion until Apple fixes this. There may be multiple causes of this error message because I get the error message regularly and have 300GB free on a 500GB SSD. 32GB RAM and the message has popped up with only about 24GB of physical RAM used. It's always been when I had a crap ton of Safari tabs open. I suspect a memory management issue with Safari. Maybe some websites trigger it but Safari should be resilient enough to recover. What exactly does “out of application memory” mean? Does this mean my fusion drive has split? Startup disk has no more space available for application memory? Can a dedicated GPU use/share system RAM in addition to the VRAM included with it? How to isolate sys / kernel vars that may cause odd problems and “no mountable file systems” on a high memory system? “Your system has run out of application memory”, but memory pressure is not even at 50%? Can macOS be prevented from pausing an app when the system runs out of application memory? How to resume a “paused” application after an out of memory situation? “Your system has run out of application memory.” Springboard leak?